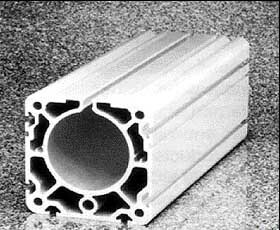 Extrusion is the process of forcing heated aluminum through a die under extreme force to produce the desired shape. Extrusions can be made in literally thousands of complex shapes. Billets are preheated and forced by a ram through one or more dies to achieve the desired cross-section. The product is long in relation to its cross-sectional dimensions and has a cross section other than that of rod and bar and pipe and tube.